Kalachakra is a black skinned, four-faced god with twelve arms and twenty-four hands. He is the personification of time, and his name carries that meaning. The Sanskrit word “kala” means time and “chakra” means cycle. The name makes reference to the cyclical nature of time in Buddhist and Hindu cosmologies. In these traditions, time is nonlinear and without end, having an almost three-dimensional quality. When we refer to Kalachakra we may be referring to the deity himself, to the mandala dedicated to him, or to the body of teachings associated with this deity. The teachings, called Kalachakra Tantra, are considered to be some of the most advanced and complex in Tibetan Buddhism. In recent years they have been publicly proclaimed by the Dalai Lama to be especially important for this degenerate age. According to His Holiness, the Kalachakra teachings can help promote world peace. The Buddha, while appearing on Vulture Peak in Northern India to recite the Prajnaparamita Sutra (known in English as the Heart Sutra, a famous discourse on the role of emptiness in Buddhism), simultaneously appeared in Dharanikota and delivered the Kalachakra teachings to King Suchandra of Shambhala. Shambhala was a sacred mythical kingdom that is iconically representative of virtue in the Tibetan historical narrative. Fiercely pious warrior kings ruled there for centuries and dedicated themselves to the protection and spread of Buddhism. Although thought to have once been a carefully guarded secret of the Shambhala Kingdom, the Kalachakra Tantra is now widely known. The Dalai Lama himself has given thirty-three separate initiations into this practice all over the world, including in Tibet, India, Switzerland, Canada, and the United States. In an essay on his website, His Holiness writes, “the Kalachakra initiations empower the disciple to practice the yoga of the Kalachakra tantra, and, ultimately, to achieve the state of Shri Kalachakra.” As with other mandala practices, the goal here is for the initiate to “enter” into the mandala and identify with the deity represented therein. Through meditation on the Kalachakra mandala, monks invoke the qualities of the deity, striving in a ritualized way enter the mandala and become the deity themselves. This practice is not usually public, and mostly occurs behind temple walls. In the public realm, the Kalachakra mandala is sometimes rendered as a thangka, a traditional style of Tibetan art frequently used to depict mandalas, and also as a sand mandala. 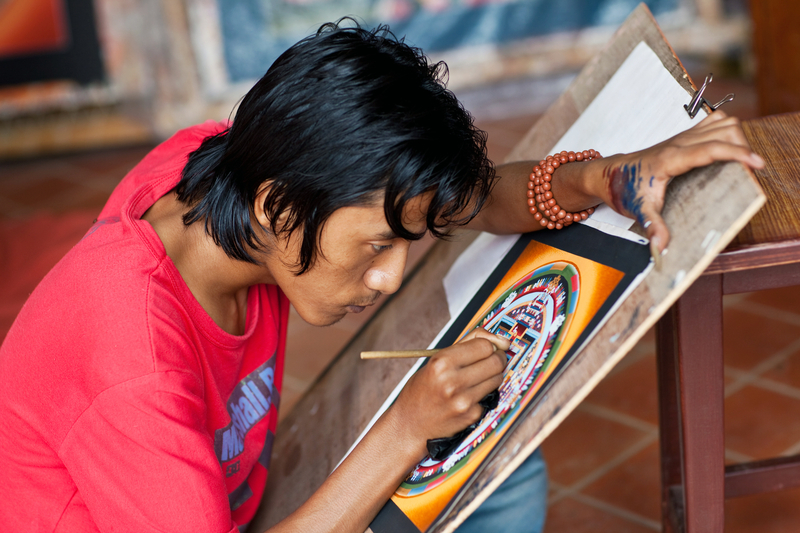 Sand mandalas are performed as a cultural display in universities or other institutions by traveling monks. Upon completion, they are destroyed in a ritual meant to honor the impermanent nature of reality. The symbolism of the mandala is rich. 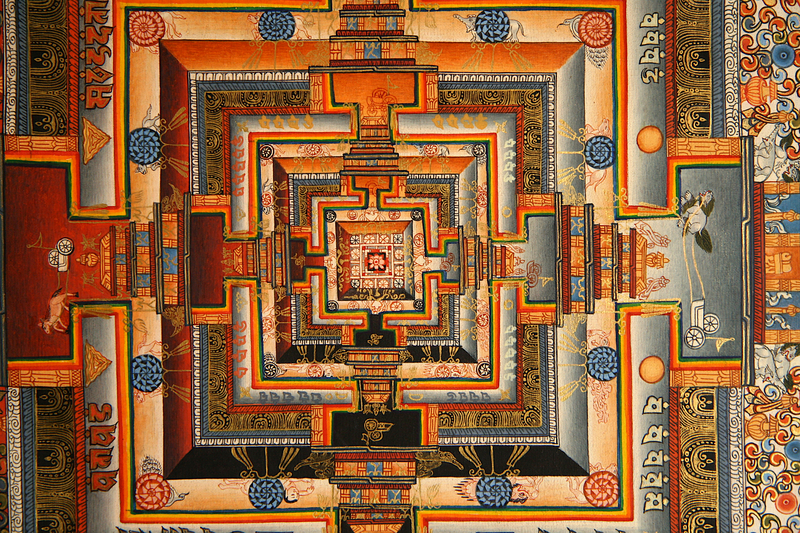 It is a two dimensional depiction of the three-dimensional palace of the deity Kalachakra. At the top of the palace, or the center of the mandala, dwells the god himself. Arrayed around the halls of the five-story palace beneath his feet are 722 other deities, all submitting to the great god Kalachakra who symbolizes the unstoppable passage of time. Taken together, all of these elements compose a microcosm of the universe, ruled by time personified. There is a project at Cornell University to render the Kalachakra mandala in three-dimensional computer graphics. The project is available to the public and really makes the mandala come alive. It uses short video segments to tour each level, and is accompanied by audio of chanting Tibetan monks.